Looking for tees that put a smile on your face while looking great at the same time? Busted Tees, online at BustedTees.com, is the store for you. This store provides customers with t-shirts designs that are newly created by the company or friends, just for you. Plus, Busted Tees not only carries t-shirts, but hoodies, kids clothing, posters, and other fun stuff as well, in categories including television, movies, wordplay, and politics, just to name a few. Check out RetailSteal for amazing Busted Tees discounts, Busted Tees promos, and Busted Tees coupon codes -- then head over to Busted Tees and shop today. Shop at Busted Tees and enjoy 40% savings on all orders. Click here to shop. Shop at Busted Tees and enjoy 20% savings on all orders. Click here for code. Save 10% on merchandise from Busted Tees when you use our coupon code online today. Get free shipping at Busted Tees when you spend $75 or more. Click link for savings. Get four BustedTees Shirts for up to 60% off. Click link to shop. 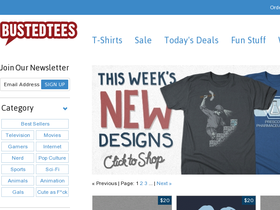 Join the BustedTees Shirt of the Month Club, and receive one tee a month plus free shipping on your entire order. Click link to save. Shop the clearance sale at Busted Tees and save big with tees starting from $6. Click here to shop. Get Tees for just $10 at BustedTees.com. Click link to buy. Visit bigdogs.com and get underdogs boxers for only $5.99 on all sizes. Click here to shop. shop at bigdogs.com and save 30% on lounge pants. For men and women including plaids, solids, and exclusive prints.